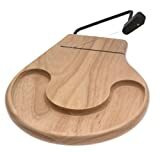 912B Features: -This party perfect beechwood cheese slicer/server tray has a convenient recessed cracker well for entertaining. -Stainless steel cutting wire sinks easily into even the hardest cheese to guarantee a perfect slice, thick or thin, every time. -As with all of our cheese slicer the wire is replaceable. -Board has non-slip rubber feet and comes in a full color box. Product Type: -Slicer and cutter. Finish: -Beech. Base Material: -Wood. Handle Material: -Stainless steel. Operation: -Manual. Food Compatibility: -Cheese. Item Type: -Countertop. Dimensions: Overall Height - Top to Bottom: -3". Overall Width - Side to Side: -13". Overall Depth - Front to Back: -8". Overall Product Weight: -3 lbs.